If you are going to be using a snow thrower this winter, one of your top priorities should always be concerned with safety. Failure to do so could results in bodily harm or injury. 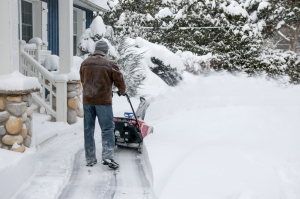 Suburban Lawn Equipment is here to help prevent any accidents from occurring with these helpful safety tips when using a snow thrower! Clear debris before using. It’s important to keep in mind that the snow thrower is a powerful piece of equipment and it will pick up debris or rocks in its path. To avoid damage clear the area before use. Wear appropriate clothing. Clothing and other accessories are at risk of becoming entangled in the moving parts of the snow thrower. Avoid wearing long scarves, dangling jewelry, or any other form of loose clothing while operating this machinery. Go with the wind. Whenever possible, do not fight the wind. Try to point the chute downwind so that it helps blow snow. Avoid severe weather conditions. You should always avoid operating a snow thrower during heavy snowfall or minimal visibility. Waiting for heavy snowfall to pass is the recommended time to start using the snow thrower. NEVER use hands/feet to clear a clog. If you experience a clog or blockage you should first shut off the equipment, and then use either a long clean out tool, stick or broom to dislodge snow or debris from the moving parts. If you need help preparing for winter, contact the experts of Delaware at Suburban Lawn Equipment! This entry was posted in Outdoor Power Equipment, Snow Blowers and tagged safety tips when using a snow thrower, snow thrower safety tips, snow throwers delaware on October 21, 2014 by Suburban. After a winter storm hits, you are faced with the dreadful task of clearing the snow. While using a snow shovel is great for removing heavy snowfall on decks and short pathways, a snowblower is ideal for driveways. At first you may be apprehensive about investing in something that can only be used during one season, but after hearing the advantages you won’t think twice! So what are the advantages of owning a snowblower? Read the list below to learn more! Time Saver. A small snow blower can remove 650 pounds of snow in 60 seconds. No one wants to spend hours outside in the freezing cold just clear the driveway. If you own a snow blower you can clear the snow and drive away to work within minutes. No physical labor. The best thing about having a snow blower is that no strenuous activity is necessary, you just start the machine and steer it in the right direction. This is particularly beneficial for preventing medical conditions like straining your back. Snow Free Driveways. The snow blower is an extremely efficient piece of power equipment that effortlessly throws snow 20 to 30 feet away, leaving you with a flawless driveway that is safe for you and your family when using foot traffic. This entry was posted in Commercial Lawn Equipment, Snow Blowers and tagged cub cadet snow blowers, snow blowers delaware, snow blowers for sale on October 14, 2014 by Suburban.